Quite possibly the finest markers you'll ever own, these water-based markers have an extra fine nib on one end and a brush marker on the other. 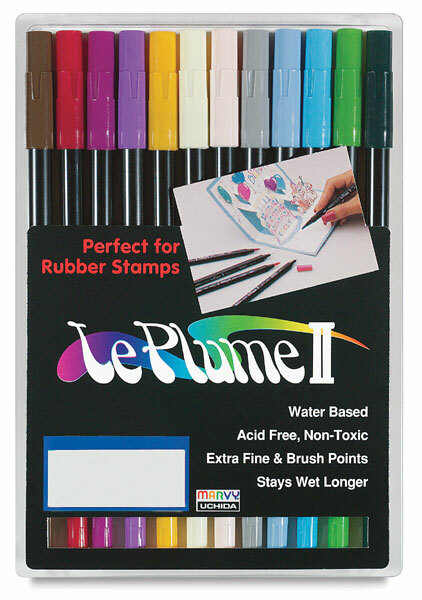 Made to stay wet longer than the average marker, Le Plume markers are perfect for brushing on rubber stamps and producing an evenly colored stamp. Available in specially selected sets to suit your color needs. Markers come in a plastic, snap-shut case. Acid-free. Non-toxic. Set of 12, Bright Colors — Includes one each of Leaf Green, Ultramarine, Yellow Green, Iris Purple, Peacock Green, Sky Blue, Butterscotch, Persimmon, Scarlet, Emerald, Sapphire, and Amethyst. Set of 12, Basic Colors — Includes one each of Magenta, Bottle Green, Silver Gray, Pale Violet, Manganese Blue, Cream Yellow, Brilliant Yellow, Crimson Lake, Pale Pink, Leaf Green, Salvia Blue, and Mocha. Set of 12, Garden Colors — Includes one each of Red, Yellow, Brown, Olive Green, Dark Brown, Crimson Lake, Bubble Gum Pink, Pine Green, Butterscotch, Pumpkin, Jungle Green, and Eggplant. ™ Le Plume is a trademark.